London singer-songwriter Tom the Lion, aka Tom Visser, officially released his debut album ‘Sleep’ on the 11th of August on Wrasse Records. Initially an independent effort pursued by Visser and his manager, the album was picked up by Rough Trade earlier this year and garnered enough support on its own merits for a full release. We here at TGTF have already featured one of its tracks, ‘Silent Partner’, as well as the non-album track ‘Wasting Sunlight’. Visser is a multi-faceted musician who writes, plays, and produces all of his own material. His early musical influences started at home, where his mother exposed him to classic singer/songwriters like Rickie Lee Jones and Bob Dylan and his jazz musician father introduced the likes of Miles Davis and Chet Baker. It does seem that having a background in jazz produces a particular willingness to experiment with sound, and Visser is no exception in that regard. On ‘Sleep’, he balances a strong sense of poetic lyricism and melody with a variety of instrumental textures and harmonic choices to shade the album’s fundamental melancholy tone with subtle degrees of emotion. In contrast, tracks like ‘Oil Man’ and ‘November’s Beach’ are stark and edgy. ‘Oil Man’ has a thin, synthetic sound that emphasizes its strange, unsettling harmonies and eerie vocal tone. The machine-produced drums on ‘November’s Beach’ create a crisp chill under the diffuse shimmer of keyboards and guitars. ‘Winter’s Wool’ features a groovy bass line and guitar melody under its smooth instrumental sheen. The album ends with a especially nice sequence of memorable tracks. The delicate texture and uneven rhythm of ‘Ragdoll’ adorn some of Visser’s most poignant lyrics, “you lost without a fight / just to be polite…you’re a ragdoll in my arms / with no charms / I’m a tyrant in this land / blood on my hands”. The persistent rhythm and and guitar line in ‘Heal’ lead into another inspiring chorus with the determined lyric “I choose now to heal”. ‘Come to Life’ ends the album with another tinge of sadness in the haunting lyric “The note you left behind / on the pillowcase I’ll find / I’m nothing but disguise / dressed as your lover might”. Its deliberately unresolved emotion is representative of the album as a whole, which is a series of vignettes left to speak for themselves rather than being painstakingly expanded or meticulously explored. In that way, Tom the Lion distinguishes himself from artists to whom he is likely to be compared to, including inevitably Bon Iver. Visser’s songs are similarly impressionistic, with the same falsetto vocal that Justin Vernon and Thom Yorke fans adore, but their brevity gives them a greater sense of emotional urgency and allows the unique experimental aspects of the music to make a more powerful impression. 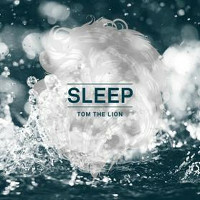 Tom the Lion’s debut album ‘Sleep’ is available now on Wrasse Records.